Eliminate the need for hours upon hours of training with the La Marzocco Swift. This espresso grinder handles it all, from grinding to dosing to tamping with ease. Programmability eliminates inconsistency in your espresso extracting process as well, making it even easier to make a name for your coffee shop. Also, when it comes to the bottom line, this grinder eliminates a lot of the waste commonly found in other grinders. It is easier to clean and prevents wasted coffee residue. High Capacity: Two giant hoppers (4 pound capacity each!) mean you can keep plenty of luscious whole bean coffee at the ready, both decaf and regular. Reduces time spent filling the hopper. Programmable Consistency: The Swift espresso grinder will remove variability from your espresso grind, and can keep consistent the little things like quantity and tamp pressure, both done automatically. Automatic Tamping: The La Marzocco Swift grinder will automatically tamp, ensuring consistent pressure applied to the coffee puck every time. High Speed Ceramic Burrs: Arguably the best burrs are flat ceramics (still up for debate, we know), but the La Marzocco Swift utilizes them to ensure not only longevity but also minimal heat transfer to the freshly ground beans. Volume Dosing System: Forget about timed dosing, which leads to inconsistent quantities. The La Marzocco Swift uses a volume-based system which ensures you get the same amount of coffee grind every time. 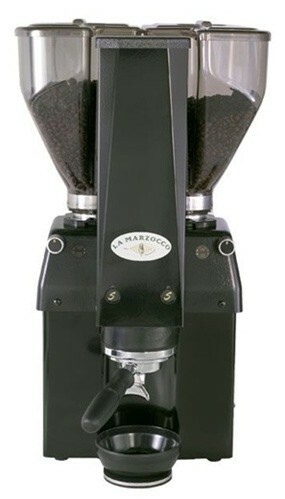 Professional - The La Marzocco Swift is built for the coffee professional. This grinder is capable of handling the long lines of the morning rush. Programmable - Eliminate a lot of inconsistency found in other grinders with several programmable options such as dosing and tamping, making it even easier to keep the line moving. Commercial Size - Two separate 4 pound hoppers keep both your decaf and regular customers happy. Expensive - The price tag on this one is considerably higher than other grinders, so it's not for the budget conscious. Heavy - At a hefty 75 pounds, once this grinder is in place, odds are good you won't want to move it anywhere else. Note: La Marzocco commercial espresso machines are covered by a limited commercial-class warranty, which includes parts only and assistance with coordinating on-site repair services. Self installation may void your commercial warranty. Please discuss with your commercial sales rep for more information.